We had a wonderful time at Jellystone Park! We had a great, spacious level pull through site. They gave us a deal (without even asking) because we traveled there evacuating Hurricane Florence. While there they had so many great activities planned that were free for us to participate in. There are so many fun things to do that we didn't even need to leave the campground. All of the staff was so friendly and patient, from my kids being nervous about going down the big slide to being shy doing other activities. One lady gave them stickers with free ice cream coupons. They loved seeing the characters and the glow stick train ride. When I called I was a little skeptical because the person who answered seemed clueless. I'm so glad I didn't let the reservation process stop us because we ended up having a great time. The lazy river could use paint, but for the price, I wasn't expecting anything too fancy. I didn't use the restrooms or laundry room, but saw they were conveniently located. The dog park was very cute with a slide, tunnel, and poles for the dogs to jump over and crawl under. We camped at Yogi Bear's Jellystone Park at Madison in a Fifth Wheel. We really enjoyed Shoal Creek Campground. There were some things such as people listening to music loudly late at night and trash around the area that could have made it better. It was also pretty hard to get in with a 40ft fifth wheel. Someone had to move their car so we could make the curve. But the size of the sites and also being on the lake made it worth it despite the flaws. We would camp there again. We camped at Shoal Creek Campground COE in a Fifth Wheel. This park could be a nice park, but it seems to have no one keeping up with it. They were closed Tuesday and Wednesday so we arrived Tuesday with no one to tell us anything and no warning for that to happen. We never did receive the WiFi password. Our site was also covered in broken glass and ant piles and they hadn't mowed in a long time. The area was so nice that if they just managed it, it'd be amazing. The sites are spacious and with the trees it could be beautiful. It's very close to everything too. We camped at Lotts Island Army Airfield RV Park (Military FamCamp) in a Fifth Wheel. We had a great time at Wilderness RV Resorts. When we arrived a super nice guy showed us to our site and told us everything we needed to know. There were a lot of full timers in there, most were very friendly. The Town Park area is the best spot to stay if you are under 55. There are 3 pools, one in each section, so nothing is over crowded. They have a nice game room and laundry room also. And the whoppie pies are amazing! The only negative I have is there are no picnic tables, so bring a table. We camped at Wilderness RV Resorts at Silver Springs in a Fifth Wheel. Silver Springs State Park is only 5 miles away and Juniper Springs and Silver Glen Springs are close by too. We enjoyed this campground! The amenities are a little dated, but the kids (and even the adults) still enjoyed them! They had a playground, plenty of outdoor games, and also an indoor area with toys and games. The owner was extremely friendly. He showed us to our site and helped spot to park it. It was very quiet and peaceful and an easy drive to Helen. There was a good selection of cable channels and the wifi was the best we've ever had at a campground. We will definitely return. We camped at Cherokee Campground in a Fifth Wheel. Close by was the Alpine Village and Anna Ruby Falls which are both wonderful. We also enjoyed tubing down the river with Cool River Tubing. And Ziplining with Nacoochee Adventures. We stayed at Sadler's Creek State Park in a 40 ft fifth wheel. The sites were pretty close together, but the lake view was amazing. Our size RV wouldn't fit anywhere except in loop 1. We couldn't use the dump station because our fifth wheel was too big and there was no easy way in and out. Make sure you check out the dump station without the trailer attached if you plan to try it! The guy that checked us in was great! We arrived late, so he came by after hours to get us checked in. He even went back to the office to get us firewood and stamp our passport books! 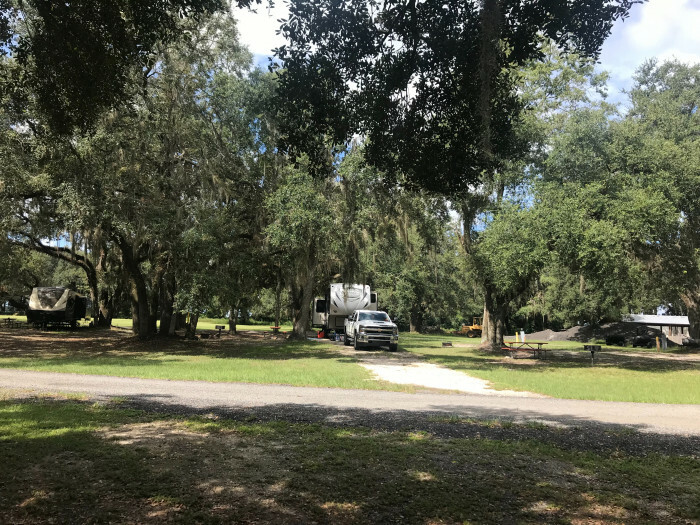 We camped at Sadlers Creek State Park in a Fifth Wheel. We stayed here in a 21ft travel trailer. The site was mostly quiet and the people were very friendly. They have full hook ups available, but we didn't have sewer on our site. There is a good amount of space between sites. You can't beat the price for Orlando! 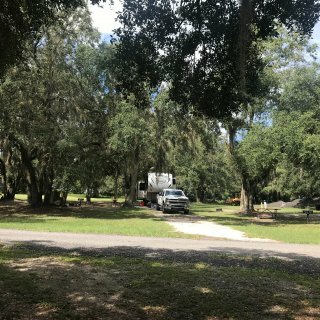 We camped at Bill Frederick Park at Turkey Lake in a Travel Trailer. We really enjoyed our stay. They are located right next to Walmart as well as other stores and restaurants. Also an easy drive to Spokane, WA and Silverwood Theme Park. The staff was very friendly. The kids really enjoyed the indoor pool and the park. Very clean and well kept area. We camped at Coeur D'Alene RV Resort in a Travel Trailer. Million dollar view! This was a fish camp we went to during the off season just to camp and had an amazing time. Very friendly staff and nice views! We camped at Olsons Resort Campground in a Travel Trailer. For only sleeping this place would be fine. But I wouldn't stay more than one night. They have excessive rules not listed on their website. The view in front of you in a bunch of run down trailers that are actually located in the park and lived in. We camped at Forks 101 RV Park in a Travel Trailer. Secluded spot and very kid friendly. We enjoyed staying here. The staff was very friendly and the area was clean with a lot to do. Wagon rides for the kids and a little animal viewing area. We camped at American Heritage Campground in a Travel Trailer.